The clocks have gone forward an hour, so I guess it must officially be Spring. It certainly feels like it, what with having the windows open and (reader, avert your maidenly gaze) flourishing my upper torso brazenly in a t-shirt. (One week a Fair Isle sweater, the next shirtsleeves – it’s all very confusing.) At the same time I feel like I’ve been strapped to the machine from The Princess Bride, and aged several decades overnight, all thanks to waking up an hour early. What news from the front? (Incidentally, did you know that the use of the word “front” for describing a war only came in after meteorology caught on in the late 19th century? Previously soldiers called it a “line”.) 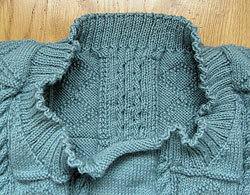 Well, the news from the line is, I’ve finished the back and – wonderful to relate – the neck too. I had another of my brainfade moments on the back, when I knit an extra half an inch. (I don’t know why – I was convinced without checking that it was right. If I hadn’t noticed, who knows what might not have happened? 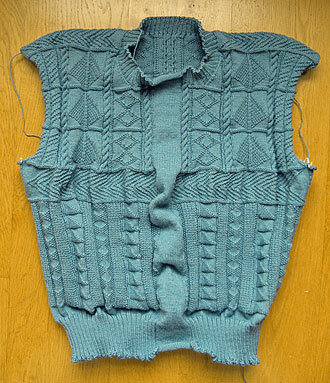 Odds are, I’d have kept on going until the cardigan developed a train as long as a royal wedding dress, and Margaret would have had to wear it accompanied by a troop of pages just to lift it out of the dirt. Not that I didn’t think of it.) So that had to be ripped out and re-done too. Since I’m in the process of printing out sample chapters and synopses and sending them off to literary agents, I’ve also been doing some research into the odds of getting published. Turns out the average agency receives over 200 submissions a month. Of these, perhaps 6 will be invited to send a full manuscript; and only 2 of them, on average, will be accepted. That’s a 1% chance of getting accepted, folks – and even then the agent still has to persuade a publisher to take you on. Wow – your sure pulled that neckline off well! Is the neckline lower cut on this cardy than it would be on a pullover? Hi Lynne – and thanks. Yes, it is a bit lower than usual, well spotted. It’s not that I’m trying to create a new fashion in plunging necklines on ganseys (what will be known to future generations as my “regency” period) – rather I didn’t want to half-start another diamond panel. In fact it’s not quite as low as it appears in the picture, as the picture shows the cardigan angled to show the whole of the shoulder straps. In real life, it will hang a little higher, so long as Margaret stands up straight and doesn’t slouch. I notice that you have left a plain triangle at the neck end of the shoulder straps and similarly have plain sides next to the completing points at the end of the shoulder straps. Is that a traditional element for horizontal chevrons? Yes and no. It was a deliberate choice when I knit the central band, I thought it would make for an interesting effect to have only whole chevrons in the pattern, and not fill in the blank triangles either side with partial ones. You can see the effect in the top photo – the right-hand edge of the central panel looks like it’s plain for the gusset, but it’s really the blank space left by the first <. I believe the traditional approach was to fill all available space, so as far as I'm aware this is "non-trad", though I could be wrong. I, too, noticed the little side triangles and thought they resembled the neck side gussets in Ruth Brown-Reinsel’s book. I like to think of them as “go faster” stripes!